Do you have a car or truck which you love? Don’t trust it to the automated car washing machine at your local gas station. For the best results, you’ll want to wash your car yourself. Not only will your car look better, but you’ll save money, too. Car wash soap plays an important role in keeping your car clean. But not all soaps are the same. Looking to keep your car clean and free from damage? Our guide to the best car wash soaps starts right now! What Do I Need to Wash My Own Car? What’s the Best Process for Washing My Car? As the saying goes, if you want something done right, you’ve got to do it yourself. While taking your wheels down to the local automated car wash is often the easiest option, but a hand wash is usually the best option for many reasons. Washing your own car is less likely to cause damage, less expensive and results in a cleaner car. All of the soaps listed in our guide have plenty of benefits. But no matter which one you choose, only use a soap specifically made for cars. Avoid using household products like detergents or dish soap, which can damage and scratch the paint. Along those same lines, don’t use a kitchen sponge or other sponge you might have sitting around the house. Instead, use a high-quality sponge made specifically for use on vehicles. Non-abrasive, they won’t scratch or otherwise harm your vehicle’s paint, windows or finish. Aside from a sponge, you can also find plenty of car wash mitts, which you wear like a mitten. Both sponges and mitts are able to soak up large amounts of soap and water for fast, easy cleaning. You can also use the same sponge or mitt to wash the wheel wells. Avoid air drying your car, as that can lead to water spots and general dullness. While towels made specifically for washing cars do exist, any microfiber towels will work fine. The tiny fibers in these towels dry without scratching, while cotton towels can actually trap small bits of debris which then rubs against your car’s paint. The size varies based on the size of your car, although 3.5 gallons is pretty standard (unless you’re washing a bus, semi or anything else unusually large). Plastic is usually the better choice than metal, as metal buckets can develop rust and corrosion over time, which can scratch your car. Most automotive experts recommend the “two bucket method” when washing your car. As the name implies, this method uses two buckets. One bucket is filled with soapy water while the other is filled with clean water used to rinse the car. You might have to refill the “rinse bucket” with clean water a few times during the wash. If you really want to protect your car against scratches, get a grit guard for your bucket. This simple sorting devices helps push dirt, stones and other heavier material down to the bottom of the bucket. If you only dip the sponge into the upper part of the bucket, you can avoid accidentally collecting potentially sharp objects. In a pinch, you can simply pour soapy water over your car and go from there. But if you want to give your car the best clean possible (and isn’t that the point?) then you want to use either a water hose or a power washer. You can use any type of spray attachment for your garden hose. A wide, gentle spray is usually the best option. Avoid any spray which is too focused and intense. Not only does the smaller coverage area make the washing process longer, but a focused line of water can potentially damage your vehicle. Don’t use a power washer unless you’re familiar and experienced with using them. The risk of accidental damage is fairly substantial when using a power washer on your car – especially if you’re not familiar with how they work. Once you’ve gathered up the right materials, the actual washing process should be quick and easy. Basically, washing your car is really no different than washing your hair. Park your car in a cool, shaded location. You want the car’s exterior to be relatively cool to the touch as well. Ideally, you’ll want to park the car on a flat location, so water doesn’t run across the car in just one direction. Each car wash soap will have specific direction for use. Generally, you’ll add one ounce of soap for every gallon of water. Remember to use two buckets – one with soapy water and the other with clean water. In most cases, the water from your tap will be fine. However, so-called soft water can be a problem in some cases. Many people find that soft water leaves behind water spots on your car, although other people have no issues. If your area has soft water you might want to use some distilled water instead. Next, you’ll want to cover the car with clean (non-soapy) water. You can spray the car with a hose or power washer or use a sponge to cover the car manually. Get a nice coating of water across the entire car. This washes away loose debris and dirt without scratching the surface. Now you’re ready to wash the car. Using your sponge or mitt, gently scrub the entire surface of the car. Use the two-bucket method to keep sharp objects out of your sponge. Next, you’re ready to rinse. While a sprayer will work, the best option is usually just the regular output of your garden hose. Rinse your car from the top down. Allow the water to cascade gentle down the car to wash away all the soap away uniformly, which helps reduce water streaks. Most car soap is safe to wash down the storm drain. Finally, you’re ready to dry. You want to dry your car as quickly as possible. All water contains at least some mineral deposits. If the water is allowed to air dry, those minerals will remain on the surface and potentially create water spots. Using a microfiber cloth, gently but quickly dry your car immediately after rinsing. Experts typically recommend washing your car once a week. Although that might seem like a lot, there are several benefits to a weekly wash.
Contaminants take a little over a week to damage most car paint. Two major hazards are bird droppings and insect remains. As they break down, they release complex proteins and organic acids which can cause corrosion and discoloration. Another potential hazard is brake dust, an invisible chemical by-product which can coat your car and corrode the paint. Driving in traffic will cause brake dust to build up on your car. The good news is that all of these potential hazards need to stay on your car for an extended period of time to cause damage. Which means a weekly car wash will generally remove all of these contaminants harmlessly. 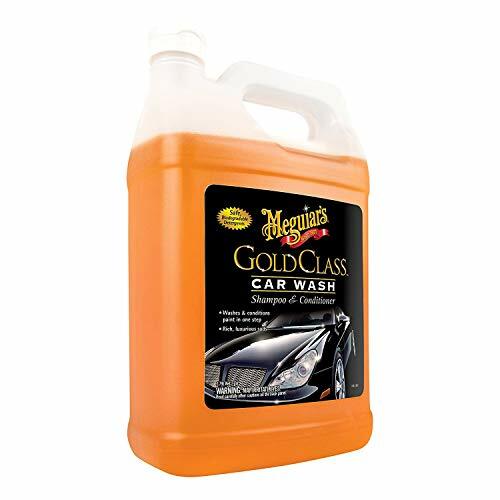 Meguiar’s Gold Class Car Wash both cleans and conditions your car without scratching the paint or removing the wax. Meguiar’s Gold Class car is specially formulated to clean the toughest dirt and grime without stripping away wax protection. The soap is foamy with an ultra-rich conditioner, which helps protect against scratches. Also works well for pressure washing. Only a small capful is necessary to create enough suds for practically any vehicle. Use one ounce of soap (four capfuls) per every gallon of water. Each bottle contains enough soap for 64 standard car washes. 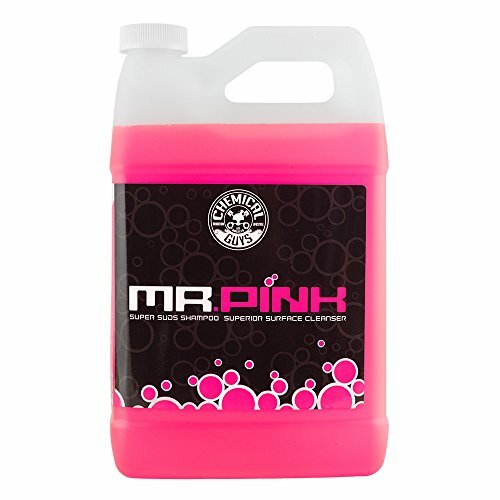 A powerful, pink soap which uses hyper surfactants to remove all types of dirt and debris. Mr. Pink Super Suds has been a favorite of car enthusiasts for years and it’s easy to see why. The soap uses super-slick polymers with hyper surfactants to lift dirt away from the car’s exterior, preventing any accidental scratches. A very sudsy formula, this soap works best with a microfiber mitt (although sponges work well, too). This foamy soap can be used on every part of your car from wheels to paint and more. Can also be used in a foam cannon or foam gun for high-level detailing. The pH-balanced formula washes away easily with no residue or spots. A deep cleaning foam removes build-up, dirt and grime while leaving behind a brilliant shine. 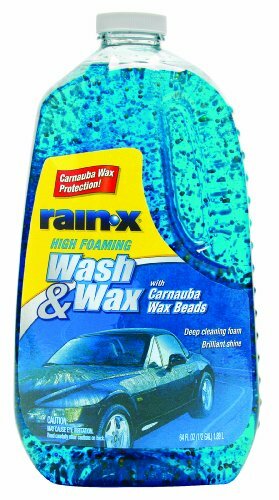 The Wash and Wax soap from Rain-X is the perfect choice for anyone who lives in extreme temperatures. Regular use of this high impact foam helps protect your car from potential damage due to snow, rain and other environmental hazards. Creates a long-lasting shine. The soap is basically a two-in-one product because beads of carnauba wax are placed within the formula. As you clean your car, you’re also applying a light coating of protective wax. Formula is completely biodegradable and pH balanced for safe use on practically any type of car paint. Aside from removing dirt and grime, this soap also enhances your car’s color by adding a bold, stunning shine. 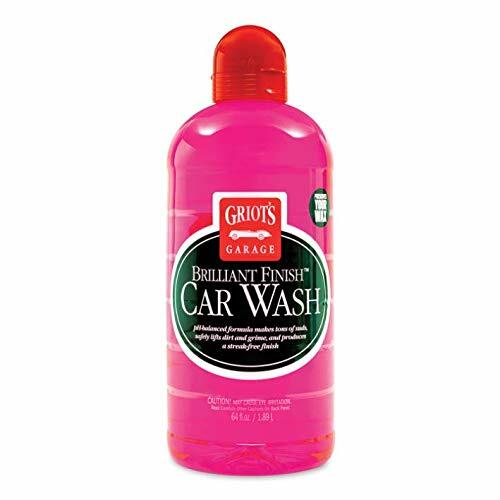 Griot’s Garage has been creating car care products and soaps since 1990, and their Brilliant Finish Car Wash is one of their most popular products. Concentrated ingredients create rich, slippery suds which lift away dirt and grime. Also includes special brighteners which enhance and add shine to your car’s exterior paint. pH balanced and ultra-concentrated, this car wash soap is a great value. Just one ounce creates a bucket full of suds for easy cleaning. Even with weekly washes, just one 64-ounce container could last you an entire year! Provide tender-loving care for your car with this wash and wax formula which adds spot-free shine. 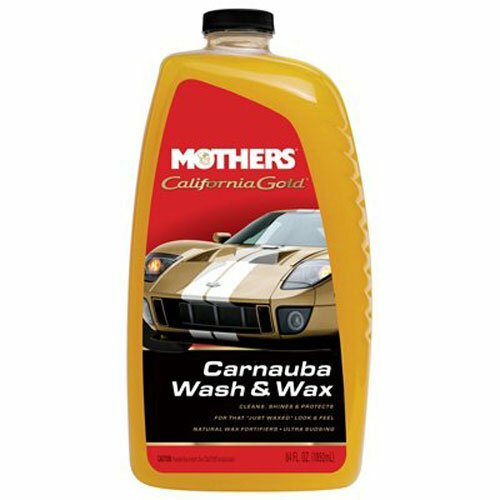 Mother’s California Gold Carnauba Wash and Wax is more than a car wash soap. It also contains Carnauba wax to boost your existing wax protection. Your car won’t just be clean; it’ll also look like you just applied a fresh coat of wax. The formula rinses away quickly with no residue or buildup. A great solution if you’re looking for a spot-free finish. Regular use can help protect damage from the harsh summer sun. The local car wash down the street isn’t doing your vehicle any favors. For the absolute best results, you’ll want to wash your car yourself by hand. A hand wash removes more dirt and grime while also reducing the potential for scratching. The right equipment makes an important difference. Using our guide above to select the perfect car wash soap. When you chose the right car wash soap, your car will look better than ever!